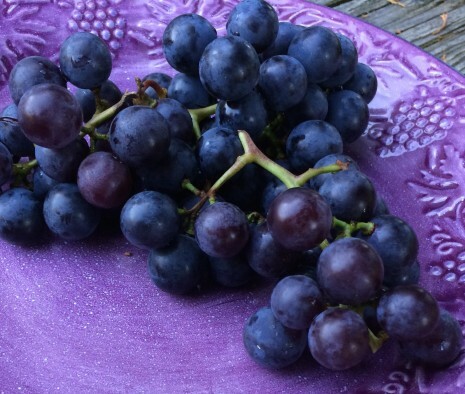 CONCORD GRAPES: AUTUMN’S JUICIEST FRUIT | Jane Lear. Writing on Food and Travel. Right now, people I know are putting up preserves, reorganizing their closets, or wrangling a wayward comforter into a duvet cover. I admire their industry and foresight, but truth is, I’m more of a grasshopper than an ant. I’d rather be outside in the October sun, poking around in the garden without doing anything much except harvesting lettuce and sizing up green tomatoes for frying. We’re having a run of what my mother used to call “Champagne days”—with a high blue sky and air that’s dry and crisp, with a hint of effervescence. I don’t want to miss a moment. Which is why so much of the cooking I’m doing is completely in the moment. Swing-season polenta is always a favorite at our house this time of year, for instance, as are fresh shell beans, eggplant tian, or, if company is coming, Chicken Marbella. And then there are Concord grapes. The cultivar was developed in the 1840s by horticulturalist and physician Ephraim W. Bull, who named it after Concord, Massachusetts. Bull lived there—his neighbors included the Alcotts, Emerson, and Hawthorne—and according to his New York Times obit (October 13, 1895), he noticed the wild vine growing by a hedgerow or fence. Its fruit was a great favorite of birds, and so Bull transplanted the vine to the rich soil near a drain from his kitchen, where, the obit writer noted, it was still growing at the time of his death. Bull spent years experimenting with some 22,000 grape plants in order to develop the perfect, cold-hardy crop, and the genetic provenance of the Concord has long been unclear. According to any number of sources, the Concord grape was derived entirely from the wild Vitis labrusca (native to eastern North America), while others thought it was more likely a hybrid of two or more grape species. Just recently, genetic sequencing solved the mystery: As it turns out, the Concord is indeed a hybrid of V. labrusca and the European grape, V. vinifera, backcrossed with V. labrusca. That doesn’t make me love it any less. All I really care about is that it is autumn’s juiciest fruit, and eaten out of hand, you can still taste the wild vine. I can’t get enough of its lush, intoxicating foxiness. If I were a perfect person—or at least, exhibited some trace of antlike behavior—I would make the best Concord grape jam on the planet. But this year, we may have to be content with a sorbet that looks like purple velvet and tastes just as luxurious. Two ingredients, ten minutes active time—what is not to love? I made it after breakfast, and while it’s turning itself into something transcendent, I’ll be outside. 1. Purée half of grapes in a blender until smooth, then force through a fine-mesh sieve into a bowl, discarding the solids. Repeat with remaining grapes to yield 3 cups purée. Whisk in sugar until dissolved. Refrigerate until very cold, 3 to 6 hours. 2. Freeze in ice cream maker, then transfer to an airtight container and put in freezer to firm up, at least 2 hours. Sorbet keeps 1 week. I just made Chicken Marbella last night – so delicious! I love your mother’s “champagne days” description. I look forward to Concord grape season all year long and make a few pies when they come on. Thanks for the history, too. 22,000 grape plants to get the perfect one…Wow!